In this retelling of a Cherokee creation story, an old couple discovers that someone has stolen cornmeal from the storage basket behind their house. Cornmeal keeps the people from starving during the winter, so this is not a trivial loss. The next night, their young grandson spies to catch the thief and is astonished to see a huge, eerily glowing dog push aside the lid with its nose, eat more cornmeal and dash away. The next morning the bewildered villagers call the Beloved Woman, a leader who is old and wise. She examines the tracks of the spirit dog and tells everyone how to cooperate to scare it away. Her plan works. As the great dog flees into the sky, a trail of stolen white cornmeal falls from its mouth, forming the Milky Way. The colorful illustrations have flat, stylized faces but fine detail in clothing and background. The illustrator, a member of the Cherokee Nation herself, chose to depict Cherokee clothing of the late 1830s. The Beloved Woman has white hair and wears a cloak of feathers; the old couple are gray-haired but otherwise look no different from the younger adults. 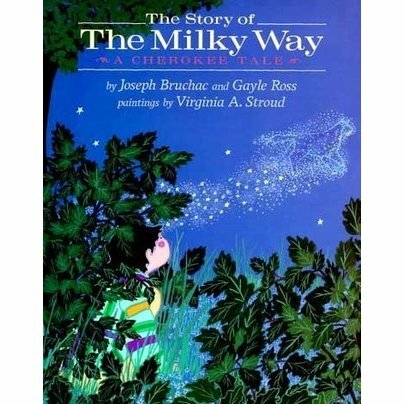 According to the authors’ notes, some traditional versions of this story emphasize the outrage of the Cherokee people against anyone who would steal from the elders. In addition, powerful women are important in Cherokee tradition. Children will enjoy this story in which a child and a highly respected old woman help solve a challenging problem.